If you’re looking for a destination that combines education and fun, then you’ve come to the right place! 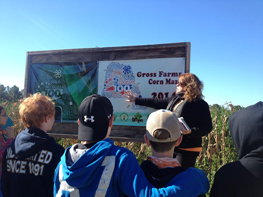 We offer student field trips catered to school groups that can connect our farm activities to your classroom studies. Group tours begin at 9:00 AM, 9:30 AM or 10:00 AM*. Tours can be completed in 3 hours or less depending on your arrival time and whether or not you participate in all 5 activities listed below. * Groups must indicate if they do not want to use the corn maze as one of the activities on their tour or it will be included. * PLEASE NOTE: Groups that arrive at 10:00 AM can only participate in 4 out of the 5 offered activities. Gross Farms closes at 1:00 PM on week days. Weekday hours are reserved for large (25 OR MORE STUDENTS) School Field Trips and Company Groups/Organizations by appointment only. Sorry, no walk ups are permitted. NO EXCEPTIONS. This number DOES NOT include chaperones or siblings. A minimum of $212.50 will apply to confirmed groups who arrive at the farm and do not meet the minimum of 25 Paid Student Admissions. Large groups will be divided into 2 or more smaller groups to maximize your experience on the farm. Members of each group will rotate together while visiting each activity. Please be prepared to divide into groups if necessary. * Groups that arrive at 10:00 AM will participate in 4 out of the 5 offered activities at the farm. If there is an activity that you do not want your group to participate in, it must be noted on your reservation form. We will begin accepting reservations for our 2018 Season on August 20. 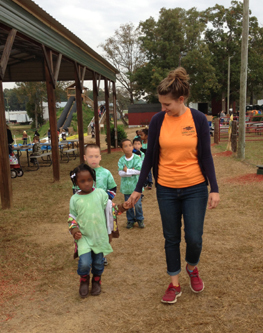 School Group Field Trips are held on Mondays through Fridays, beginning October 1 – November 9. Groups must have a MINIMUM of 25 Paid Student Admissions per reservation in order to book a School Field Trip during the week. GFCM staff member will briefly meet with your group upon arrival. Please arrive on time. Successful daily schedules count on groups arriving and beginning on time. If your group is arriving separately, please gather together and purchase tickets at the same time. Large groups will be divided into 2 or more smaller groups to maximize your experience on the farm. Please be prepared to divide into groups if necessary. 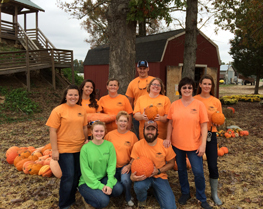 Members of each group will rotate together and experience all activities while visiting the farm. A GFCM staff member will direct each group to their activities. A lunch/snack schedule will be given to you upon arrival if you requested the picnic area. Note that lunch/snack times must be limited to 30 minutes in order to accommodate daily schedules and other groups. Arrive 15 minutes prior to your reservation time in order to allow time for unloading students. Tours will begin at the Reservation Time. If groups arrive late, time may not permit students to participate in all activities. If your group is running late, please call 919-498-6727 to inform us as soon as possible. Have payment and headcount ready when arriving. Gross Farms accepts cash, check and most major credit cards. One school check is preferred. Bring water for students! There are no water fountains on the premises. Bottles of water are available for purchase at the concession building. Teachers may want to bring boxes or coolers to transport pumpkins back to school. Sharpie markers are also useful in writing students names on the bottom of pumpkins. Please review the following rules before departing school. Do not pick or throw corn while in the corn maze. Do not stand or throw hay or other horseplay on the hayride. Do not run or jump on any hay bales used on the farm. Do not stand on the top of the wooden train in the Play Area. 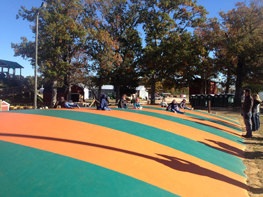 Students must wait in line until the staff member allows them to enter the Pumpkin Jump and Tom's Tunnel areas. 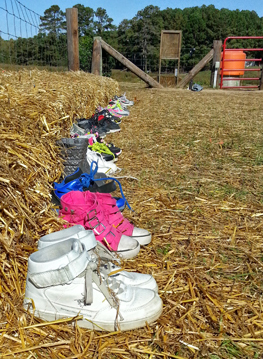 Shoes must be removed and placed along fence before getting on the Pumpkin Jump. Please place all trash in the trashcans provided. Confirmations will be sent to the contact person listed within 3 business days. Groups are not considered registered until a confirmation notice is received from Gross Farms. * We will begin accepting reservations for our 2018 Season on August 20. School Group Field Trips are held on Mondays through Fridays, beginning October 1 – November 9. If it is necessary to cancel or reschedule your reservation, please contact us by email at reservations@grossfarms.com or call (919-498-6727) as soon as possible, but no less than one week prior to your scheduled field trip date. Because all activities are located outside on the farm, we will close if it is raining. If your tour is cancelled due to inclement weather, we will make every effort to try and reschedule your group as space permits.